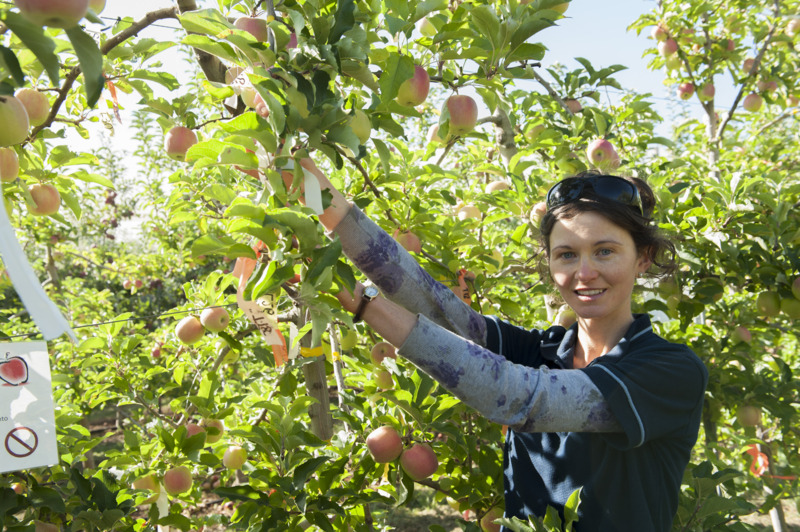 Permanent netting was set up in October 2013 to assess the effects on fruit quality, bird damage, water use efficiency and orchard productivity. The demonstration, established in October 2013, aims to show the value of netting to improve water use efficiency and orchard productivity in high density production systems. It is now heading into the second year of a three-year trial, to assess the value of permanent netting as a way to improve water use efficiency and orchard productivity. The project is comparing the effect of black and white netting on water use, fruit quality, tree growth and chilling accrual in a high density apple production system. The results from the first season can be found on the page 'Netting saves water at apple demonstration site'. The 1.2 hectare (ha) demonstration has 0.5ha of permanent net constructed over an established Cripps Pink and Fuji apple orchard. Areas of black and white 16mm quad netting were installed, each covering 0.25ha. The remaining area contains two comparison blocks, a DAFWA-managed control, and a grower practice control area. Another block may be added using a different type of structure with grey netting sourced from Europe (Frustar) prior to the 2014-15 irrigation season. Independent irrigation systems have been established within four areas of the 1.2ha trial block. The system allows areas under each netted section, a control area and a possible third netted area to be scheduled independently and compared to growers’ standard practices. Monitoring equipment in each block provides real-time information that allows fine-tuning of irrigation decisions on the basis of water availability and plant needs. Watering decisions are based on weather conditions, evaporation and soil moisture measurements. Using the available technology enables better irrigation decisions to be made, improving water use efficiency. Netting apple orchards is one way to adapt to climate change. The South West of Western Australia is expected to experience higher than average temperatures, reduced rainfall and increases in evaporation as a result of a changing climate. These climatic conditions have the potential to affect the pome fruit industry, resulting in increases in water use, more extreme temperatures and changes to winter chill accumulation. Further data collection in coming seasons will help assess the differences in netted and non-netted apple production. It is expected that by the end of the project growers will have a clear picture of the benefits and practice changes required to produce under netting. Comparing Bird Damage in a netted and non-netted orchard, funded by Department of Parks and Wildlife. The demonstration also complements the Manjimup SuperTown project that is exploring ways to revitalise the town and region as a centre of fruit production.